The UCLA Department of Urology is committed to ongoing Prostate Cancer research in a quest to develop new treatments and cures for all urologic conditions, along with a commitment to educate and train the next generation of leading physicians and scientists. 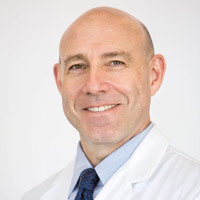 Dr. Aronson has worked extensively in the field of nutrition and prostate cancer for the past 20 years and has multiple publications demonstrating anticancer effects of nutritional strategies. Dr. Aronson's research team has demonstrated anticancer effects of dietary fish in mouse models and human trials. He also maintains an active laboratory at UCLA evaluating the biological effects of dietary fish providing omega-3 fatty acids on prostate cancer growth and evaluating biomarkers to be applied to clinical trials. 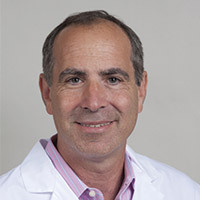 Dr. Aronson is funded by The National Institutes of Health to research the role of dietary fish and low-fat diets for prostate cancer prevention and treatment. 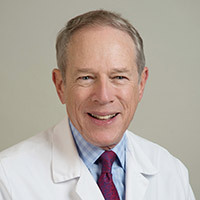 He has over 150 publications in peer-reviewed journals including The New England Journal of Medicine, The Journal of Clinical Oncology, Cancer Research, and The Journal of Urology. The ultimate goal of his research program is to discover whole food approaches utilizing a healthy fish-based diet for the prevention and treatment of malignancies and to promote longevity. 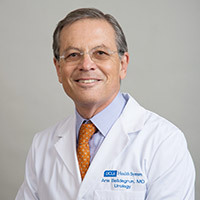 Dr. Belldegrun is internationally recognized in the field of surgical and medical management of urological cancers, designing and conducting large-scale clinical trials, and in the development of innovative therapies for patients with localized and metastatic kidney, bladder, and prostate cancer. Dr. Belldegrun’s research laboratory at UCLA has been a pioneer in the fields of genetic cancer therapy, immunotherapy, cancer vaccines, and targeted molecular therapy for urological malignancies. Dr. Arie Belldegrun's research focuses on targeted specific therapy and immunotherapy of kidney and prostate cancers. Belldegrun's laboratory reported on the cloning of a tissue specific and androgen responsive novel 620 bp PSA promoter sequence and upstream sequence. The enhanced gene expression of the resulting construct, combined with its tissue specificity and androgen responsiveness, provide the foundation for the development of tissue specific vectors for prostate cancer gene therapy. Belldegrun's laboratory also has studied the feasibility of isolating functional dentrictic cells from the peripheral blood of renal cell carcinoma patients and has compared their transduction efficiency using various methods of transferring gene markers into dentritic cells. 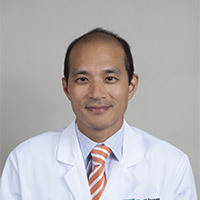 Arnold Chin, M.D., Ph.D, is a physician-scientist dedicated to improving the lives of patients with urologic malignancies. Focused on bladder and prostate cancer, his research team studies how the immune system recognizes and modulates cancer growth, invasion, and metastases. Current projects include understanding the mechanisms that distinct immune pathways use to regulate tumor growth and spread, which will be important in identifying targets for novel immune-based therapies. A second area is focused on understanding bladder cancer stem cells, which may be the origin of the cancer. These cells may be resistant to current therapies. Targeting the cancer stem cell population, the team is studying the molecular and genetic mechanisms and is developing a personalized therapy program for bladder cancer patients to match specific treatments with patients. Chin hopes his studies will determine which tumors may respond to specific treatments and design novel therapeutics that optimize the body’s own immune system to fight cancer. Dr. Isla Garraway is the Principal Investigator of a basic science laboratory in the Jonsson Comprehensive Cancer Center. Her current projects are focused on human prostate stem cells and prostate tumor-initiating cells, as well as development of human prostate tumor models. Specifically, Dr. Garraway is developing ways to isolate specific stem cells from patients with prostate cancer. These cells likely constitute a small fraction of all cells in the prostate, and have the unique ability to regenerate themselves. Understanding what role stem cells play in cancer tumor growth could prove to be monumental in developing future targeted therapies for prostate cancer patients. 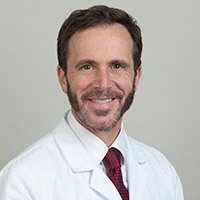 Dr. Mark Litwin holds a Bachelor’s Degree in Economics from Duke University , earned his MD from Emory University , and trained in urology at Harvard Medical School 's Brigham and Women’s Hospital. He spent two years as a Robert Wood Johnson Clinical Scholar at RAND and UCLA, where he earned his MPH. He is a translational population scientist who has authored numerous original articles, reports, reviews, and book chapters in urologic oncology and health services research. Dr. Litwin published the first validated quality-of-life instrument to track outcomes in men with prostate cancer and has been an international leader in this area. Dr. Litwin's research includes medical outcomes assessment, quality of care, health-related quality of life, epidemiology, costs and resource utilization, patient preferences, and health care access for malignant and benign diseases in urology. Dr. Litwin’s post-doctoral research fellows have held academic positions at institutions such as Harvard, Duke, Columbia , Vanderbilt, UCLA, and the Universities of Michigan, Virginia , and Washington , as well as in Japan , France , and the Netherlands . In 2001 he received the AUA Gold Cystoscope for his foundational work in establishing the discipline of urological health services research. In 2011, he received the AUA Distinguished Service Award for his continuing work in this field. His work has been funded by the NIDDK, NCI, Department of Defense, American Cancer Society, California Department of Public Health, and other organizations. He has been continuously NIH-funded since 1997. His current grants include an $80 million state-funded program involving prostate cancer care for low-income uninsured men in California , as well as a $17 million epidemiologic study of the burden of urologic diseases in America . 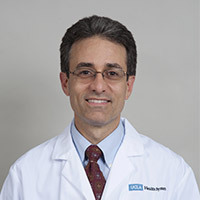 He teaches in UCLA’s Schools of Medicine and Public Health and practices urologic oncology at UCLA. Dr. Litwin’s research is currently funded by the California Department of Public Health, National Institutes of Health, National Cancer Institute, the Agency for Healthcare Research and Quality and National Institute of Diabetes and Digestive and Kidney Diseases. The primary research interests of Dr. Leonard Marks include prostate imaging and targeted biopsy, along with Active Surveillance of prostate cancer. Of all the major cancers, prostate cancer is the only one that cannot be imaged in the organ of origin, while still curable. A multi-disciplinary team has been assembled, under the aegis of the Department of Urology, to resolve this quandary. The ultimate goal is the rational treatment of localized prostate cancer: early diagnosis and cure for those men who need to be cured and avoiding treatment in those men who wouldn’t benefit from it. The new approach calls for a sophisticated MRI to be performed in advance of prostate biopsy. Using techniques of diffusion-weighted imaging and dynamic contrast enhancement, in conjunction with a larger-than-usual magnet (3Tesla), many prostate cancers can be visualized on MRI images. By fusing these MRI images with real-time ultrasound, biopsy can now be targeted directly toward areas of interest, not blindly into the prostate, as in past years. A substantial NIH grant has recently been awarded to the Department for development of this concept. The team consists of specialists in urology, radiology, pathology, and biomedical engineering. Dr. Allan Pantuck’s research programs focus on gene and immune therapies for GU cancer, molecular and genomic characterization of kidney cancer, and nutritional chemoprevention of prostate cancer. Funding has been received and work completed on a project to study chromosome 9p alterations in kidney cancer, a continuation of work started in Dr. Pantuck’s NIH-awarded K23 training grant, which ultimately led to publication of a manuscript in the journal Cancer. Dr. Pantuck’s work on genetic and molecular characterization of kidney cancer will now continue with a recently funded grant, for which he is the PI, from the Department of Defense titled “Early diagnosis of clear cell kidney cancer using VHL/HIF pathway regulated circulating microRNA,” which seeks to identify a novel panel of microRNAs that are measurable in serum for the early diagnosis of kidney cancer. 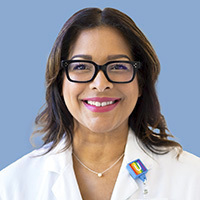 Furthermore, Dr. Pantuck will receive funding for an NSF SBIR phase II grant with the UCLA Momentum Incubator spin-off Fibron Corporation, and will also serve as co-investigator on a recently funded, 5 year NIH-funded R01 grant on prostate cancer imaging. For ten years, Dr. Pantuck has been collaborating with Dr. Arie Belldegrun to develop a targeted kidney cancer vaccine (AdGMCAIX). A RAID grant was successfully submitted to produce clinical grade vaccine material, and its manufacture has now been completed. A clinical trial utilizing this GMP manufactured vaccine has been approved by the FDA Recombinant Advisory Committee, and toxicology studies are being completed in support of an IND application for an investigator initiated clinical trial to be performed at UCLA. The intellectual property for AdGMCAIX has been successfully licensed to Kite Pharma. Two patent applications have been submitted to the Office of Intellectual Property, US Patent application No. 61/103,895, Genomic Predictor of Kidney Cancer Prognosis and Interleukin-2 Treatment Response and UCLA CASE NO. 2010-306: Molecular Signature to Predict Prognosis for Localized Clear Cell Kidney Cancer. Dr. Pantuck’s research is currently funded by the National Institutes of Health, Department of Defense and the National Science Foundation. Dr. Robert Reiter runs a large basic and applied research program in prostate cancer. He is currently the Principal Investigator of UCLA’s SPORE (Specialized Program in Research Excellence) program, a 12 million dollar multifaceted research program that strives to translate basic science advances in prostate cancer to the management of men with this disease. There are currently only 9 active SPORE programs in the United States , of which UCLA’s is the only such program in California. 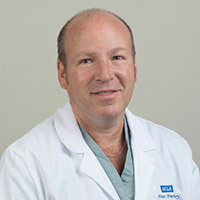 In addition, Dr. Reiter is only one of two urologists who lead such programs in the country. Dr. Reiter’s own research focuses on four main areas: (1) the development of antibodies against prostate cancer proteins that can be used to treat prostate cancer (2) novel imaging technologies for prostate cancer, including radiolabeled antibodies for PET imaging and MRI for local cancer imaging (3) the application of molecular markers to predict prostate cancer prognosis and for the personalization of therapy, and (4) the role of stem cells in prostate cancer. Dr. Reiter’s lab has gained international attention for its discovery of the PSCA (prostate stem cell antigen) gene and the development of antibodies against PSCA that have entered clinical trials for both the treatment and imaging of prostate (as well as pancreatic) cancer. His lab was among the first to discover the utility of the molecular marker p27 as a prognostic factor in prostate cancer. In addition to the SPORE grant, Dr. Reiter has won numerous awards and honors, including the Stop Cancer Young Investigator Award, the Society for Urologic Oncology Young Investigator Award, and election to the American Society for Clinical Investigation. His work has been funded continuously for 14 years by the National Cancer Institute, the American Cancer Society, the Department of Defense, the New York Academy of Medicine, the Margaret Early Trust and other funding agencies. Dr. Christopher Saigal’s research is focused on the nexus of quality of care and trends in medical technology. The Urologic Diseases in America project, an ongoing, NIH-funded research enterprise, evaluates quality, cost, and technology trends in major urologic conditions such as prostate, kidney and bladder cancer, as well as benign diseases such as benign prostatic hyperplasia and kidney stones. Over 60 policy-relevant manuscripts have resulted from this project. Other major research efforts involve finding ways to use technology to improve decision making for patients in the setting of localized prostate cancer. Specifically, this research tests ways to improve “shared decision making” using computer applications. 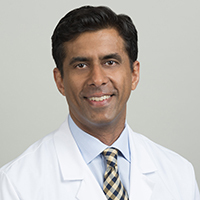 Dr. Saigal also leads the UCLA site for two national NCI-funded trials to examine outcomes of care in men treated for localized prostate cancer. Dr. Saigal’s research is currently funded by the National Institutes of Health, National Cancer Institute and the Lance Armstrong Foundation. Dr. Gang Zeng’s ongoing research involves dendritic cell (DC)-targeting prostate and kidney cancer vaccines, as well as A+PSA technology for improved prostate cancer diagnosis and risk assessment. Dendritic Cell (DC)-Targeting Prostate and Kidney Cancer Vaccines: DC-based vaccines have shown encouraging results in treating castration resistant prostate cancer. However, most DC vaccines require tedious and costly manipulations ex vivo. More potent cancer vaccines capable of targeting immature DC in vivo and bypassing the ex vivo manipulations, are critically needed. The presence of DC surface receptors for a new class of damage-associated molecular patterns indicated novel approaches for DC-targeting in vivo. This project addresses the immunological and anti-tumor effects of DC-targeting vaccines using the myc-CAP prostate cancer and Renca kidney cancer models. A+PSA technology for improved prostate cancer diagnosis and risk assessment:We have developed a novel multiplex assay that simultaneously measures auto-antibodies and PSA in a single reaction (termed the A+PSA assay). This new technology is being investigated for aiding prostate cancer diagnosis with reduced unnecessary biopsies as well for predicting lethal from indolent prostate cancers with reduced overtreatment. Dr. Zeng’s research is currently funded by the National Institutes of Health, American Cancer Society, Neuberger Berman Foundation and the Dr. Susan Love Breast Cancer Foundation.